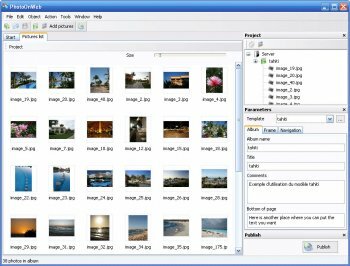 PhotoOnWeb is a software to create your own photo album with digital pictures and host it on the internet. The software offers quick and easy creation and customization of the album (more than 20 different templates to match the theme of your pics). Sort your photos in multiple albums, pick a template and click on the Publish button. It does it all for you, resizes the photos, builds the website and publishes it on the Internet. yep.. it does what it does well.. i may just use the imbedded simpleviewer directly next time though as that's easier to drop into other things. I think this is THE best program of its kind: flexible, good-looking, easy to use and FREE (amazing!). Very easy to use and uploads are fast. The Generated pages are nice... Editing the templates are not really easy, but possible. That feature is for the more advanced web designer, however what they give you is well worth a look.